Khula Aasmaan presents an exhibition of medal winning artworks from Pune region. Khula Aasmaan is a FREE platform for creative expression by children. Khula Aasmaan conducts contests for children. Every quarter, a shortlist is prepared and Khula Aasmaan creates a dedicated web page for each shortlisted child. This dedicated web page is managed for the next 3 years. The shortlisted artworks undergo another round of judging to decide medals. 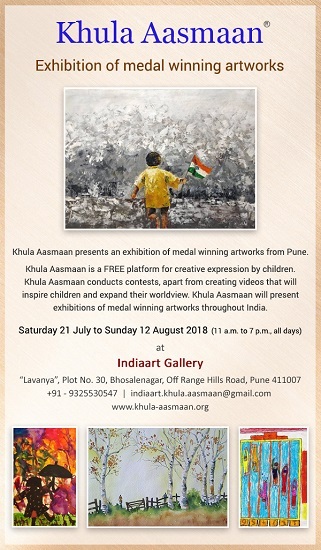 This exhibition features medal winning artworks from Pune region which have won gold, silver and bronze medals in Khula Aasmaan quarterly contests so far. Khula Aasmaan will present exhibitions of medal winning artworks throughout India. Khula Aasmaan invites school children, young adults, parents and teachers to visit this wonderful show. The exhibition is sure to inspire children to express themselves. They are welcome to draw or paint at the gallery and submit their entry to the current Khula Aasmaan contest.